I found the need to purchase a polish relating to the Pantone Color of the Year for 2012 - Tangerine Tango. 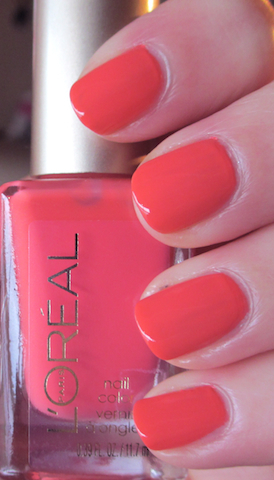 I read that L'Oreal Tangerine Crush was a dupe for one of the Sephora Pantone Universe Nail Polishes. Even if it's not, I do love this color. It applied like a dream and I found it at the drugstore with a buy 1 get 1 50% off deal. I also have Wet N Wild Blazed and in the bottle, they look like dupes as well. This will be so pretty for Spring and Summer! Yay, you found it!! It looks gorgeous on you.